WHAT IS SARCOMA Cancer ? A sarcoma is basically a cancer that is of the connective or supportive tissue, which are basically a bone, cartilage, fat, muscle, blood vessels and soft tissue. This term is derived from the Greek word, which means 'fleshy growth'. Sarcomas are also referred to Bone tumours but they belong to an entirely different category, due to their different experimental and infinitesimal distinctiveness and they are also treated another way. One of the most common childhoods bone cancers are known as Osteogenic sarcoma or osteosarcoma. In adults Soft tissue sarcomas are seen as being more common than would be usually found in children. There are many types of soft tissue sarcoma, and they tend to grow and develop differently. The most common types are described below. Your doctor will be able to give you more details about which type of sarcoma you have. Each type of sarcoma is named after the type of cell from which it has grown, rather than the part of the body in which it started. Malignant peripheral nerve sheath tumours (MPNST). Soft tissue sarcomas in children. Fibrosarcoma : - Fibrosarcoma is a malignant tumor that arises from fibroblasts (cells that produce connective tissue). This is a type of sarcoma that is predominantly found in the area around bones or in soft tissue. Desmoid tumors : - Desmoid tumors arise from connective tissue - the cells involved with the formation of muscle, fibrous and nerve tissue. Desmoid tumors, also called aggressive fibromatoses, are locally aggressive. This means that they can grow into and even destroy adjacent normal tissues, even bones. They do not, however, have the capacity to spread distantly (metastasize) throughout the body. Hence, most doctors consider desmoid tumors to be benign and not malignant. 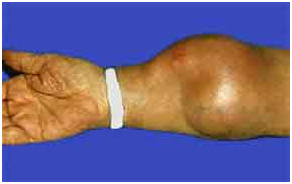 Liposarcomas : - These sarcomas start in the body's fat cells. They can grow anywhere in the body and most commonly affect middle-aged people. Some grow very slowly (taking many years to develop) and others more quickly. Synovial sarcomas : - Synovial sarcomas usually start near to joints, such as the knee or elbow, but can occur in any part of the body. They usually appear as hard lumps and are more common in younger adults. Rhabdomyosarcomas : - Rhabdomyosarcomas grow in the active muscles of the body that we can control. These muscles are known as skeletal muscle or striated muscle. Rhabdomyosarcomas occur mostly in the head, neck and pelvis, but can occur in the arms or legs. There are three sub-types of rhabdomyosarcoma: embryonal, alveolar and pleomorphic. Embryonal : - Embryonal rhabdomyosarcomas tend to occur more commonly in children, while alveolar rhabdomyosarcomas occur more in the limbs of teenagers and young adults. Pleomorphic rhabdomyosarcoma tends to occur in middle-aged people. Leiomyosarcomas : - Leiomyosarcomas start from smooth muscle that is not under our conscious control. Smooth muscle is also called involuntary muscle and forms the walls of the womb, stomach, intestine and the blood vessels. Leiomyosarcoma is one of the more common types of sarcoma and can occur anywhere in the body. Malignant peripheral nerve sheath tumours (MPNST) : - These sarcomas arise in the cells that cover nerve cells and can occur anywhere in the body. The cells around the nerve cells are called schwann cells. MPNST can also be called malignant schwannomas or neurofibrosarcomas. They most commonly occur in people who have a rare genetic disorder called neurofibromatosis (von Recklinghausen's disease). Angiosarcomas : - Angiosarcomas start from the cells that make up the walls of blood or lymph vessels. If they develop from blood vessels they are called haemangiosarcomas. If they start from the lymph vessels they are called lymphangiosarcomas. Angiosarcomas sometimes arise in a part of the body that has been treated with radiotherapy many years before. Gastrointestinal stromal tumours (GIST) : - GISTs are sarcomas that develop from the connective tissues in the walls of the digestive system. The digestive system is often called the gastrointestinal (GI) tract. This type of tumour may also be called GI stromal sarcoma. They behave differently from other types of sarcoma and are treated very differently. Kaposi's sarcoma (KS) : - Although Kaposi's sarcoma is a type of sarcoma, it differs from other sarcomas in the way it develops. It starts from cells in the skin. Coloured patches or lumps can develop in the skin, in the mouth, and in the lymph nodes or internal organs such as the lung, liver or spleen. Kaposi's sarcoma can affect people with a weakened immune system, including people with HIV and Aids. Other types can affect people of Jewish, Italian and West African origin. Kaposi's sarcoma is treated differently to other types of soft tissue sarcoma. desmoplastic small round cell tumours. Age : - Soft tissue sarcoma can be diagnosed at any age, but is more likely to develop in people over 30. Radiation : - Radiotherapy given as a treatment for other cancers can sometimes cause a sarcoma to develop years after the original treatment. This is because the radiation can affect healthy tissue in the treated area. A radiation induced sarcoma will not usually develop for at least 10 years after the original treatment. This is quite rare. Radiotherapy and surgery for breast cancer can cause lymphoedema. A very small number of women with lymphoedema of the arm have gone on to develop a form of sarcoma called lymphangiosarcoma. We must stress that this is very rare and can take many years to develop. Read More. It is very unlikely that any of these conditions run in your family and you do not know about it. Any genetic condition can crop up in a family that has not had it before. But this is extremely rare. It happens because the same genetic fault that causes the disease to run in families has occurred randomly in a developing baby. Neurofibromatosis : - is a genetic disease that causes non cancerous (benign) tumours to form in the nerves under the skin and in other parts of the body. But the risk of getting a very rare sarcoma called a malignant peripheral nerve sheath tumour is increased. About 15% of people with neurofibromatosis will have one of these cancers. Li Fraumeni syndrome : - is a genetic syndrome that causes many cancers to occur in the affected families. It is sometimes called family cancer syndrome. Families with Li Fraumeni syndrome are at a higher risk of breast cancer, brain tumours, leukaemias and other cancers. They are also at a higher risk of developing soft tissue sarcomas. Retinoblastoma : - is a type of inherited eye cancer. It is nearly always diagnosed in childhood. Children who have had retinoblastoma also have an increased risk of developing a soft tissue sarcoma in the future. They also have an increased risk of getting a bone tumour (osteosarcoma). Vinyl chloride (a chemical used in making plastics. PVC is poly vinyl chloride). Sometimes people think that an injury has caused a cancer. There is no evidence that an injury of any kind can cause a sarcoma. Because of the swelling, an injury may lead to a cancer that was already there being diagnosed. Cancers take many years to develop. In most cases where people think an injury responsible, the injury has only happened recently and so is unlikely to be linked to the cancer. Bone pain is the most common problem causing the patient to see a doctor - although specific complaints vary. Progressing pain and/or swelling and fever may occur. Pain may be relieved by rest / not putting weight on the affected limb. Symptoms similar to those of injuries, bursitis, arthritis or benign bony tumors, so diagnosis is difficult. The only reliable way to determine if a soft tissue tumor is benign or cancerous is through a surgical biopsy. During this procedure, your doctor makes an incision or uses a special needle to remove a sample of tumor tissue. A pathologist examines the tissue under a microscope. If cancer is present, the pathologist can usually determine the type of cancer and its grade. The grade of the tumor is determined by how abnormal the cells appear when examined under a microscope. The grade predicts the probable growth rate of the tumor and its tendency to spread. Low-grade sarcomas, although cancerous, are unlikely to metastasize or spread. High-grade sarcomas are more likely to spread to other parts of the body. Treatment options for soft tissue sarcomas include surgery, radiation therapy, and chemotherapy. The specific treatment plan for your child will depend on the stage of the cancer, which is based on size and grade of the tumor and whether it has spread to other parts of the body. Surgery for Sarcoma Cancer in India : - Surgery is the most common treatment for soft tissue sarcomas. Your doctor may remove the cancer and a safe margin of healthy tissue around it. Depending on the size and location of the sarcoma, it may be necessary to remove all or part of an arm or leg but amputation is rare. In most cases, radiation or chemotherapy is given before surgery to shrink the tumor or after surgery to kill remaining cancer cells. Radiation Therapy for Sarcoma Cancer in India : - Radiation therapy is treatment with high-dose X-rays, given before surgery to shrink tumors or after surgery to kill any cancer cells that may have been left behind. Read More. Chemotherapy for Sarcoma Cancer in India : - Chemotherapy is treatment with anti-cancer drugs. Chemotherapy may be used to shrink tumors and make the tumor more accessible for removal by surgery or radiation treatment, or sometimes both. If the cancer has spread to other areas of the body, treatment is more difficult. In some situations, intense therapy with drugs, radiation and surgery followed by bone marrow or peripheral stem cell transplant may be used. Some children may be eligible to participate in research projects, or clinical trials, to test new anti-cancer drugs. Patients with soft tissue sarcomas usually receive chemotherapy intravenously, meaning it's injected into a blood vessel.Read More.